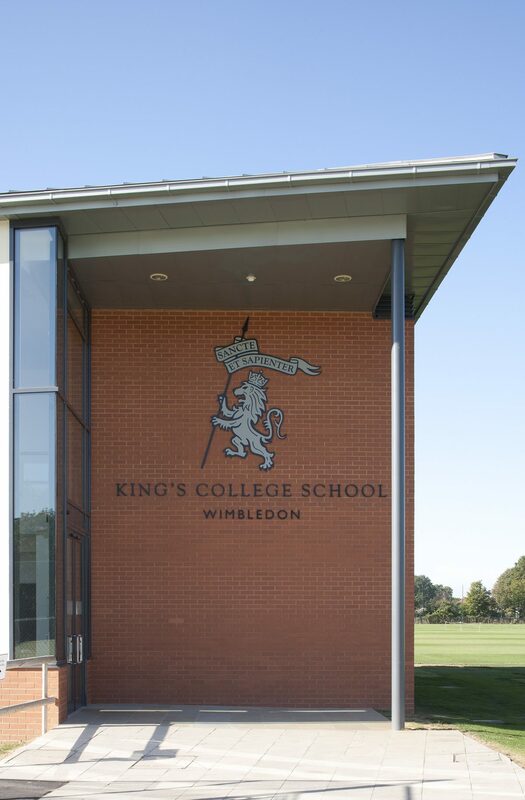 A new Pavilion for King’s College School at West Barnes Lane was completed in September 2011. It provides new twenty-first century facilities for for twelve teams and staff, hospitality and ancillary facilities. A new car park accommodates 92 cars and two coaches, and a new grounds maintenance building with storage for tractors and materials. The pavilion is placed in the centre of the playing fields, with a tapering footprint to maintain the useable space for sports. The main entrance is at the pavilion's northern corner, clearly visible from the site entrance. The whole building is designed to be as simple and legible as possible, since for many it will be their first and for some their only experience of the school. 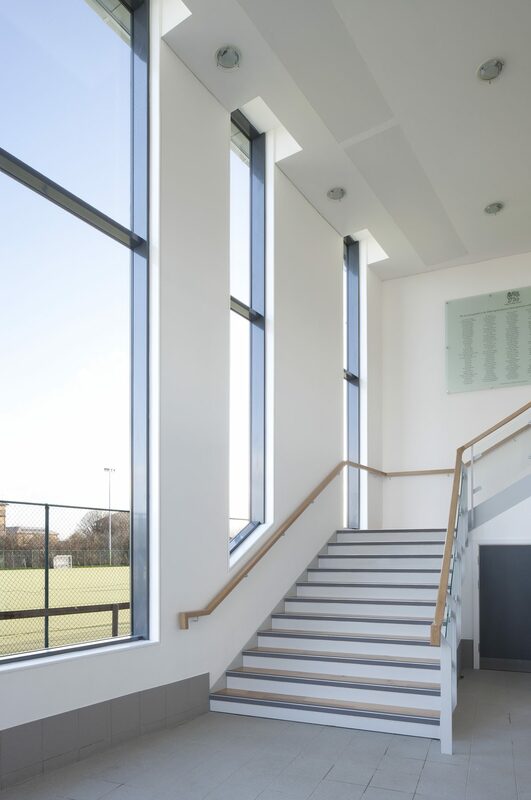 The entrance canopy, foyer and staircase are generously proportioned, red brick reflecting the material of the school's main campus in Wimbledon. Roof and eaves are in pre-patinated zinc, the folds of the material clearly visible in the soffit and overhang. Grey-framed glazing, galvanized steel, glass and plain render complete a limited palette of materials. The building aims to express something of the school's institutional culture: cleverly positioned, well engineered, articulate, self-confident, but not flashy or over-stated. Feedback of... Read more. The main entrance is at the pavilion’s northern corner, clearly visible from the site entrance. The whole building is designed to be as simple and legible as possible, since for many it will be their first and for some their only experience of the school. The entrance canopy, foyer and staircase are generously proportioned, red brick reflecting the material of the school’s main campus in Wimbledon. Roof and eaves are in pre-patinated zinc, the folds of the material clearly visible in the soffit and overhang. Grey-framed glazing, galvanized steel, glass and plain render complete a limited palette of materials. The building aims to express something of the school’s institutional culture: cleverly positioned, well engineered, articulate, self-confident, but not flashy or over-stated. Feedback of the building in use confirms that it is popular, comfortable and convenient to use, and gives the right first impression of ‘the most exciting day school in London’. 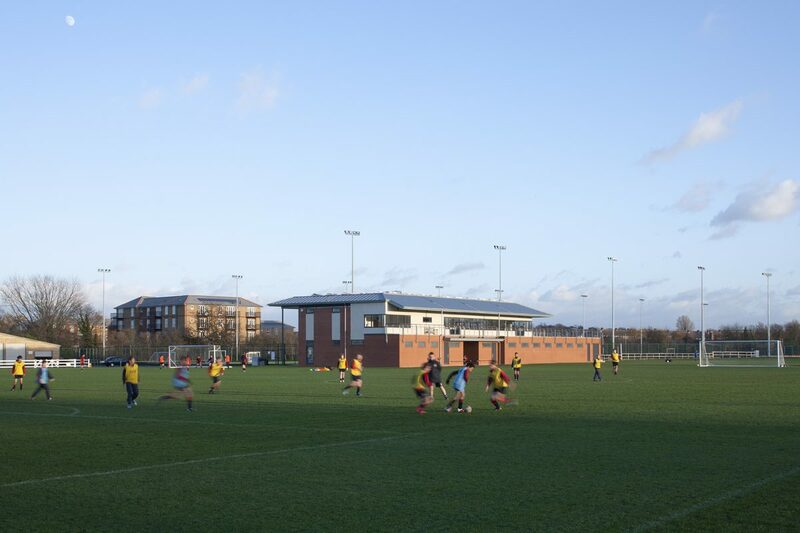 From the playing fields the building’s organisation can be clearly seen: twelve changing rooms and a ceremonial players’ entrance at ground level, hospitality and viewing terrace at first. The south and west elevations are oversailed by a deep zinc-clad canopy, reducing reflections and solar gain. 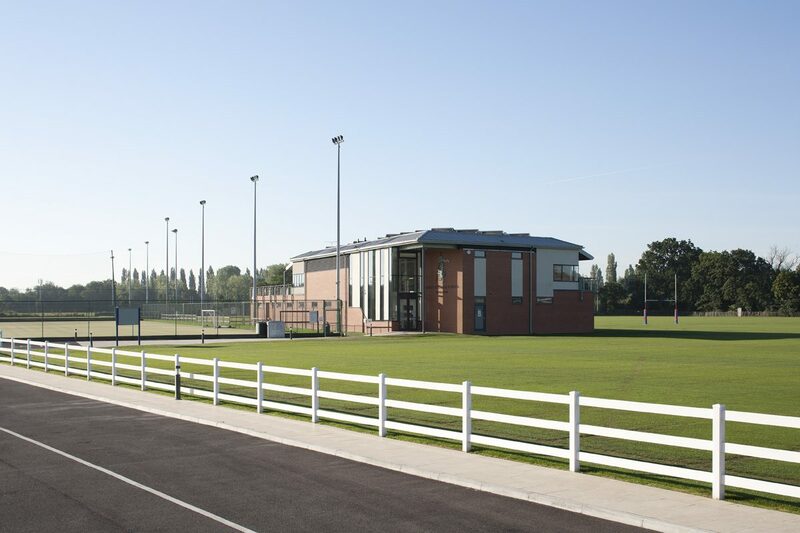 A physiotherapy room next to the main entrance opens straight onto the pitches. 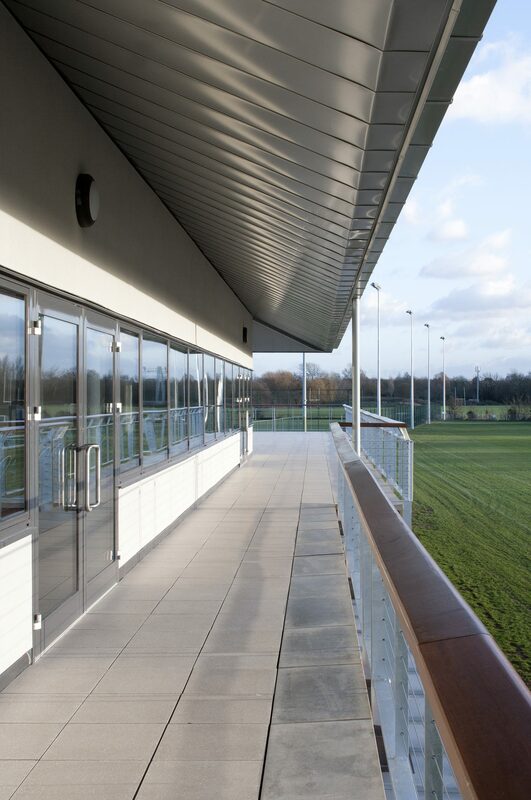 Hospitality areas and the terrace have uninterrupted views of both the grass and all-weather sports pitches. The multi-purpose hospitality room seats 168, with an adjacent kitchen and separate staff hospitality room. 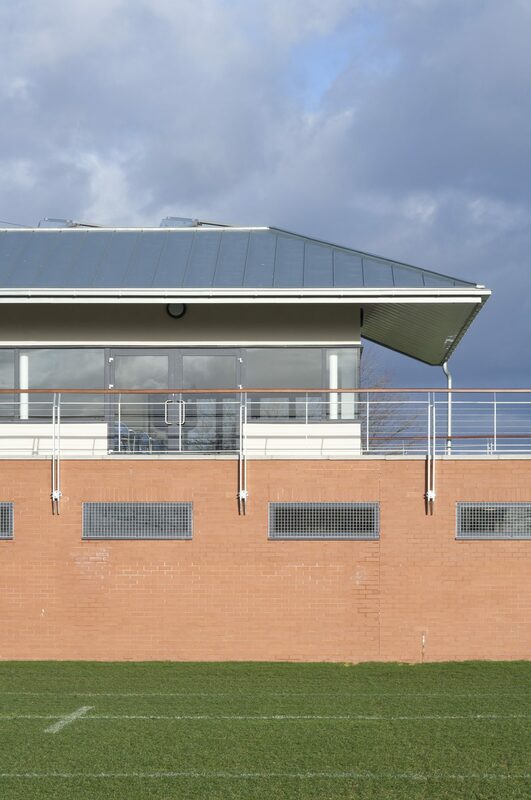 This view shows the robust base in engineering brick – the building is in a flood plain – and the upper level ‘infinity terrace’ with a minimal balustrade offering maximum views of the pitches. Above all, the zinc canopy and a glimpse of the photovoltaic cells which provide the equivalent of 20% of the building’s energy requirements in renewables.